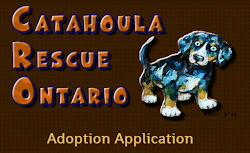 Catahoula Rescue-Ontario: Meet Tobias ADOPTED! Hello, my name is Tobias. My foster mom calls me Toby or T Bone for short. I am a small Catahoula mix, weighing in at only 32lbs. The vet says I'm about a year old, so I guess this is as big as I'll get, but that's ok. My Momma tells me good things come in small packages. My foster Mom and Dad take great care of me now. Man, this is the life! Who knew how great being a dog could really be! They love me, bathe me, and feed me good food. Already I can tell how much softer and shinier my coat is. Thanks, Mom! I love going to the dog park. Everyone there likes me too! I get so much attention, and everyone says how cute I am. Don't you think I'm cute? Momma says my chocolate brown eyes are going to melt the hearts of my new family one day. 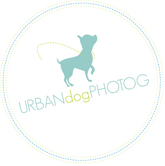 I recognize my new name now, and will come from across the dog park when Mom calls. She's so happy when I listen. Sometimes I even get treats when I do as she asks. It helps build my confidence. I think I'm getting the hang of this. I'm very curious, and like to explore new territories. Sometimes I find a kid's toy and think it's mine, but I'd much rather chew on a bone or an antler anyways. I like to play tug with my foster family, and love snuggling on Mom's lap, too. As the smallest of my pack, I stand on my hind legs to see above everyone, and hope that Mom sees me first. But she doesn't seem to like this, and I don't get my cookie till I sit. I have to sit when she puts the leash on, too. It's hard when I'm just so excited to go for a walk. I like the car rides, too. My big brother is sometimes a little to pushy for me and steps on me a lot, so Mom lets me ride up front with her. I love being close to her. I've met some of the kids in the neighborhood too. Everyone seems to like me. I like them too. It's fun getting so much attention. But when Mom and Dad have to go to work, I sit quietly in my crate and sleep until they come home again. When they return, I get so excited that sometimes I pee a little. I'm sorry, please don't be mad. I'm trying to work on this. I promise I'll make it up to you with unconditional love and kisses. Mom loves my puppy kisses. It makes her giggle and laugh. Do you like puppy kisses? Are you looking for a gentle young boy like myself to join your family? Cause I know as good as I've got it here in Bowmanville, there is a fur-ever family out there waiting for me, Mom says so. And I believe her. After all, what have you got if you don't have hope, right? I hope to be meeting you soon! Tobias is neutered, up to date on vaccinations, heartworm tested (negative), and will be microchipped prior to adoption.